When Call-A-Cab launched August of 2012, there was no Lyft or Uber. Within two weeks, an investigator from the Public Regulations Commission rang came to my office, suspicious and threatening. But when I opened the website and clicked to the GPS map on my 32″ monitor, and told him all those blue tags represented legal taxis, he loved it and invited me their Santa Fe offices and to call if I ever needed help. I had a good relationship with the PRC and did visit their offices, and got help from Ryan Jerman, the Transportation Division Director, on some legal questions. However, when Lyft and Uber entered the Albuquerque market, we were devastated. They had enormous publicity (when the Albuquerque Journal reporter killed her story with an, ‘eh, I don’t take taxis anyway’) and their incredible advantage, giving away rides and by not complying with New Mexico laws requiring business registration, tax ID numbers, insurance, application for taxi certificates, gross receipts taxes . . . well, the list goes on and on, my fledgling business was devastated, our overall fares eventually dropped 50%. Call-A-Cab had enough of its own issues. I thought that with the right promotion and publicity, customers would go to the GPS map and find the closest taxi and, call a cab. However, the advertising had no effect, we had no publicity, and customers kept trying to call a dispatch number instead of going to the GPS map. So, now Call-A-Cab’s presence on the Internet is not just on this blog but Google+, Yelp, Yellow Pages, Google Ads . . . and we have two incoming dispatch lines to help direct people to the closest cab, and teach them about the GPS map later. People are used to Smartphone Apps? Well, Call-A-Cab is not an app, it is a publicly-accessible website with a streaming GPS map showing locations of available taxis. However, not to be left out I had a programmer create a ‘bookmark’ app that positioned a graphic link (favicon) to a regular customer’s main phone screen. 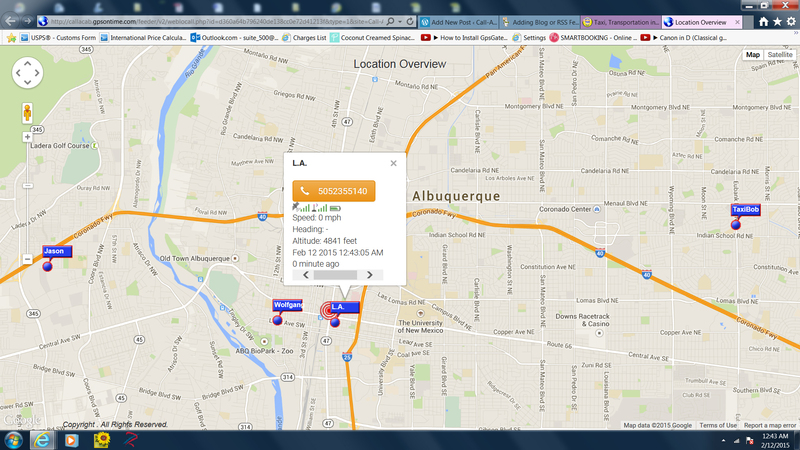 Call-A-Cab is not only equal in visual presence on your Smartphone, it is designed for Albuquerque and visitors. The main page has two main buttons, one for the map and one for calling dispatch, but it also has a menu of links to Advance Bookings, Flat Rates, Airport Arrivals, Public Transportation Schedules, Restaurant Reviews, Apartment Site Maps, and Points-of-Interest. The proceedings in considering the TNC bill in the State Senate stopped when several of the necessary numbers of Senators left the hearing. By reducing the number of Senators in the Committee below the number necessary for a “quorum” the bill died. Call-A-Cab can deliver improved logistics and luxury upsell services. 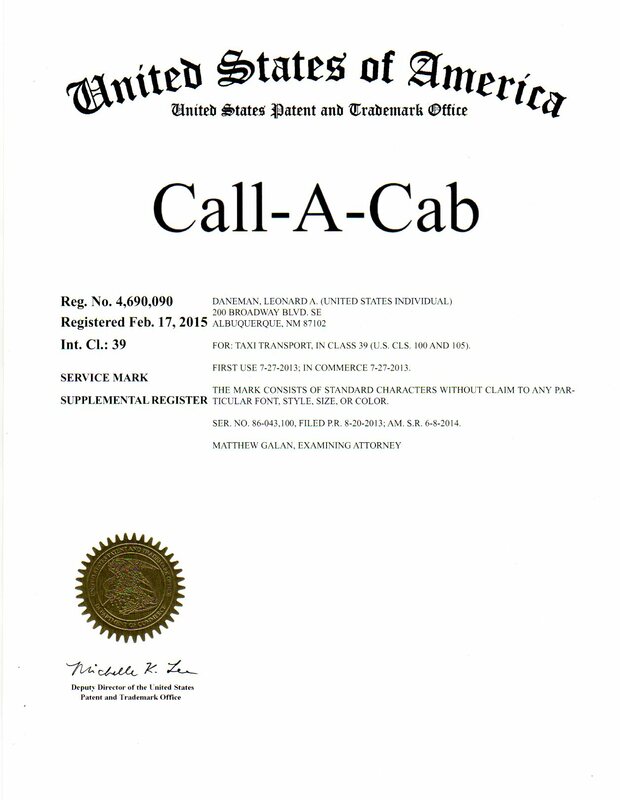 After 20 Months, Call-A-Cab, LLC is now . . .
My supplemental filing for Federal Trademark was reviewed and approved . . . only took nearly two years. I attended the House legislative hearing on HB 272, and was the last to speak. Please visit http://www.facebook.com/taxiabq for a synopsis. This site allows a number of tracking options and controls/reports over tracked units, all for a very low price. To be brief, the SmartPhone screen is simple and packed with features. 1) The top button takes you to the GPS taxi map, pictured in the previous blog post. 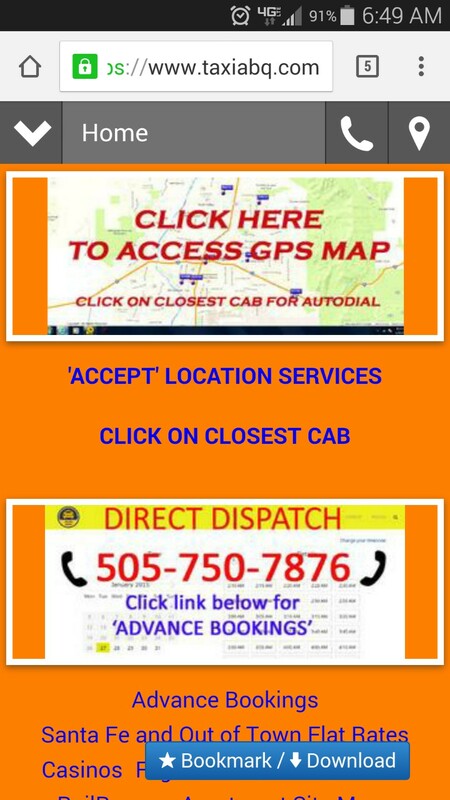 This is where the customer Accepts Location Services and can then easily click on the closest cab. The orange button features the autodial phone number to call that cab directly. 2) We are working with a Dispatch service where a human operator works the map for the new customer, books advance calls, or provides general customer service. 3) Next is an extensive menu, beginning with a link to the Advance Bookings site. This is particularly useful to hotels ordering time calls for early morning checkout taxi service. There is more, such as Points of Interest, Flat Rates, Casinos, Apartment Site Maps, etc. And now, a link to this blog! They were referring to the lack of quick taxi service during hotel checkouts and the 2 AM bar rush. To be honest, I was getting sick of it too. I tried to get Yellow Cab to insure drivers and their personal cars, leasing the PRC certificate number to create a backup crew of luxury sedans and minivans. The problem was that insurance product did not exist. Three years ago I decided logistics could be improved if proximity to the fare was the main factor, not ‘open’ calls or a ‘first up’ list in a zone system. GPS was now in all smartphones, so I designed Call-A-Cab. Call-A-Cab is just that; during peak demand the customer does not have to be put on hold by the cab company or wonder if a taxi was dispatched at all. By consulting the GPS map of tracked taxis they could just ‘call the cab’ itself, getting fast service both in talking directly to the cabbie, and getting the cab closest to their pickup location. That’s it . . . a simple concept.